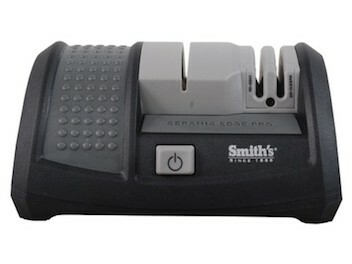 The Smith’s 50245 Ceramic Edge Pro electric knife sharpener, is a handy addition to any kitchen requiring high performance ceramic sharpening. While many electric sharpeners available today cover the full spectrum of kitchen knife styles, to have a stand alone sharpener utilizing ceramic abrasives is a good way to ensure that your knives last longer. So what technology do we have behind this particular product? Well Smith’s boast that the 50245 ceramic knife sharpener is able to produce a better than factory quality cutting edge to your blades. Using interlocking ceramic sharpening wheels in the electric sharpening slot the tool is able to deliver fast and precise sharpening on both sides of the knife blade at the same time. In fact utilizing a 22.5 degree angle on each side, (45 degree in total) your knives benefit from what Smith’s describe as a precision machined edge configuration, offering a perfect combination of edge retention, performance, and sharpness with every use. We have looked online for comments on the 50245 ceramic sharpener and have found varying opinions. 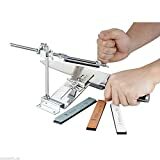 Some users have stated that the tool is very fast and easy to use, with the sharpening stage precise and economical in the amount of metal it removes during sharpening. No marring or burr marks are reported from any reviews we have read. Versatility is another one of the 50245’s strong points. 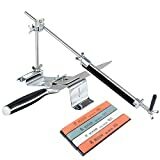 The 45-degree combined sharpening angle means that a vast array of kitchen knives as well as hunting/fishing knives and pocket knives, can be sharpened using this tool. To clarify, this includes serrated edged knives – to sharpen these the Smith’s 50245 includes a manual, pull-through sharpening slot. Ironically considering the name, ceramic blades are not catered for with this knife sharpener, or are Asian style knives, (with that angle – get serious) or with knives with a grind on just one side of the blade. 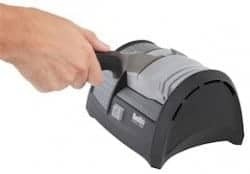 (Unfortunately the double-sided simultaneous sharpening cannot be switched off). Smith’s are a reliable manufacturer in the knife-sharpening arena, and reports on the 50245 Ceramic Edge Pro do hint that this product is a worthwhile addition to the brand.